Nova has now made the news twice in only a few weeks, with Monday’s announcement of the acquisition of Williams’ ethylene facility, ethylene infrastructure and a significant adjacent plot of land in Louisiana overshadowing its possible participation in an ethylene project together with Total and Borealis – for 2020 start-up. The Williams’ facility has been on the market for a while and there have been several rumored bidders, including Westlake and Dailim (which made a public statement of an offer). We see this as good deal for Nova – the price is high but probably fair and the IRR of the deal is dramatically improved by the immediate cash flow, versus a new project. Our expectation is that Nova will quickly announce the construction of polyethylene capacity at Geismar – alongside the ethylene unit, either alone or with Borealis (Nova and Borealis share common ownership through Mubadala Investment Co. in Abu Dhabi – Nova is 100% owned and Borealis 64% owned by Mubadala – formerly IPIC). Williams is currently the only 100% merchant ethylene player in the US – the minority interest in the facility (11.54%) is owned by SABIC, which has demand for its share of ethylene. 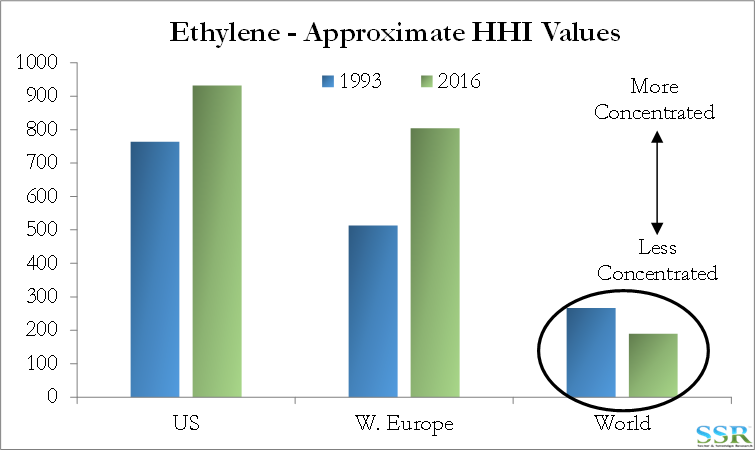 The merchant ethylene market is shrinking in the US as major buyers, such as DOW, WLK (through Axiall), ShinEtsu, Oxy and Formosa add new ethylene capacity. Both Nova and Borealis have proprietary polyethylene technology and while Nova operates facilities in Canada and has a major sales presence in the US, Borealis currently only manufactures in Europe and the Middle East, and is not significant in the US market. Nova started a new world scale polyethylene facility in Canada in the Fall of 2016 and has another facility on the books for Sarnia (Canada) to coincide with a significant expansion of the ethylene unit there – based on Utica and Marcellus shale base ethane. We believe that the company will either move the Sarnia project to Geismar – or build two units concurrently (which would make more sense if Borealis was also involved). Both Nova and Borealis have been good investments for their owners – generating billions of dollars of cash over the last four to five years because of the high margins in integrated polyethylene. The owners have allowed both companies to keep investing – Nova in Canada and Borealis most recently in Abu Dhabi. Now they clearly have their sights on expansion in North America. Short-term, Nova will likely continue to sell ethylene in the US or export through Enterprise, but it is understood that Williams does not have much ethylene contracted for the longer-term. Hence our view that Nova will need to build to consume the ethylene in the US. Nova and Borealis will likely bring more competition to the US polyethylene market and when you also add the potential of Shell re-entering (with its Marcellus plan), there are too many players – which feeds into our “consolidation” thesis. We have written recently about LYB’s recent comments, highlighting WLK as a straightforward target – CPChem as less straightforward. We are intrigued by DOW/DD comments that the first company to spin out will be materials and wonder whether the urgency there is because of a possible subsequent consolidation – LYB possible, Aramco more likely. Shell could buy someone – like LYB or CPChem as a way back in to the business.